The Coffee chart shows a remarkably stable price since 2002, generally hovering in the area of 50 mg/lb. In 2005 the price almost doubled, peaking at 95.8 on March 17, but by December had fallen back to the mid-50s. Since 2006, the price of coffee has been gradually working it's way lower, putting in a recent low of 33.3 on June 8 and ending June at 41. Coffee futures are quoted in USD, in the form of cents per pound. In 2002, the USD's value was about 100 mg of gold, making 1mg roughly equal to 1 US cent. For instance, on May 17, 2002, the price of coffee was 48.47 mg/lb or 48.40 cents/lb. But what a difference 8 years makes! 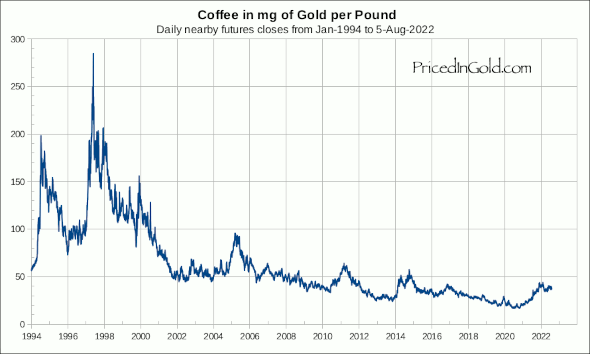 Although coffee prices ended June 2010 at 41.055 mg/lb, down 15% from the May 2002 price, the "fun-house mirror" USD price ended June at 164.20, apparently up 239%. Keep in mind that a pound of coffee is still a pound of coffee, and can be roasted and ground up to brew the same number of cups in 2010 as in 2002. A gram of gold is still a gram of gold, and can make the same fillings, or jewelry, or plate the same number of electrical contacts in 2010 as in 2002. 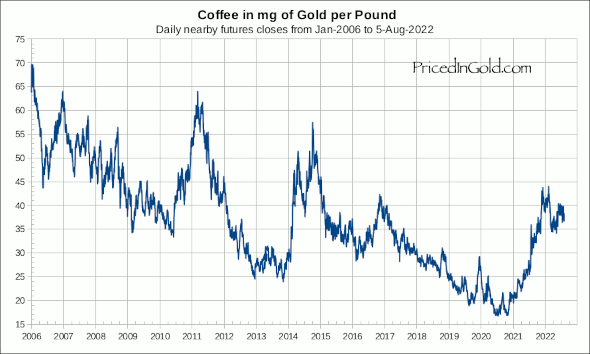 In 2010 there is a slight shift in preference in favor of gold over coffee, but we're talking about 15%. The US Dollar, on the other hand, has lost about 75% of it's purchasing power over the same time period, that is, it takes $4 today to buy what $1 bought in 2002. Holding onto dollars is playing with lighted matches! And measuring your investment performance in dollars virtually guarantees that you will have a mistaken impression of how well you are doing, making it impossible to accurately judge when to buy and when to sell. We hate spam, and will never sell or give away your name! Call anytime with questions, comments or stories! Would you like to have Priced in Gold commentary in Audio or Video formats? Let me know! Don't buy or sell a security without checking it's value and trend when priced in gold! Order your Custom Charts today!